A scavenger hunt leading participants to County parks, the Gwinnett Historic Courthouse, Red Clay Music Foundry, Suwanee Sculptour and the Duluth Town Green began on July 1st with one lucky winner receiving an iPad. Participants visit each location and post photos to Twitter and Instagram with #exploregwinnettmonth to enter. Stop by the Explore Gwinnett table at each of the events below for giveaways, discounts and Gwinnett information. 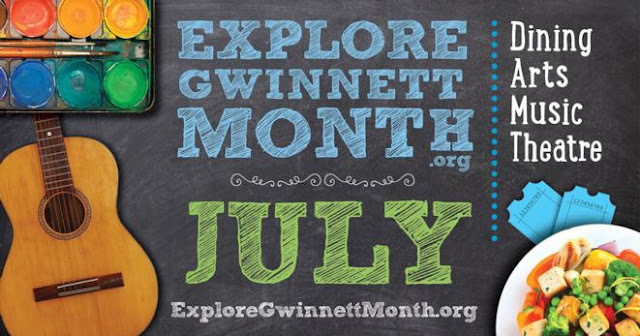 Explore Gwinnett Month discounts for Aurora Theatre, Dave & Buster’s, K1 Speed, Masterpiece Mixers, Malibu Grand Prix, Medieval Times, Treetop Quest and more can be found on the Explore Gwinnett website. Explore Gwinnett Month details can be found at www.ExploreGwinnettMonth.org.